Tripp Lite's Smart Online SU1000XLa on-line, double conversion UPS protects critical server, networking or telecommunications equipment from blackouts, brownouts, voltage fluctuations and surges in an attractive all-black upright tower form factor. 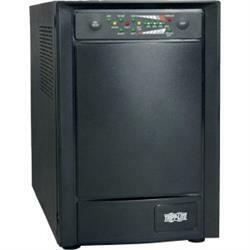 Large capacity 1kVA / 800 watt UPS continuously converts incoming AC to DC, then back to perfect sine wave AC output at 120V AC ( /-2%). Removes harmonic distortion, fast electrical impulses, frequency fluctuations and other hard-to-solve power problems not addressed by other UPS systems. True sine wave output and zero transfer time offers guaranteed compatibility with all equipment types.